CNG is a readily available alternative to gasoline that's made by compressing natural gas to less than 1% of its volume at standard atmospheric pressure. Consisting mostly of methane, CNG is odorless, colorless and tasteless. It's drawn from domestically drilled natural gas wells or in conjunction with crude oil production. Natural gas powers more than 12 million vehicles on the road today. Unfortunately, only 112,000 of these are being used in the U.S today. The average growth rate in the U.S. shows a 3.7% increase per year since 2000, as contrasted with a booming global growth rate of 30.6% per year. So where can you buy a natural gas car? The only production car now produced, and it is produced in the United States, is the Honda Civic GX - the sticker price is around $26,000. 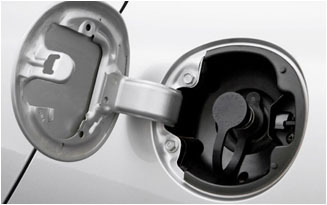 A 2012 Honda Civic natural gas car will get approximately 38 miles per gallon of equivalent natural gas. At $4.00 a gallon if you were to drive a regular gasoline car you could drive a natural gas car for 190 miles at the same cost that you paid for one gallon of gasoline for a regular gas car, which would probably drive between 20 and 25 miles on one gallon of gas. Of course you can buy your Hondas from any Honda dealer or you can on the internet or eBay and see what used natural gas cars are on the market today. In any event the rate is about 64 cents per therm and if you convert therms to equivalent gallons of gasoline you just multiply it times 1.25 and of course that gives you 80 cents per gallon. Now if you don't want to fill up at home you can fill up at one of the public natural gas stations, there are a couple of hundred in California. To find out the natural gas station closest to you just go to www.cngprices.com and put in the state that you are located. Currently as of August 2011 prices range from $1.25 per gallon in Riverside to $2.74 in Pasadena with the average being around $2.30. Click here for natural gas stations and prices. Phill cost about $4,200 and can be installed in your garage. This installation cost is around $2,000 so your total investment will be around $6,000. It puts out ½ gallon of CNG per hour. Phil is supposed to run about 6000 hours between overhauls and an overhaul can be as much as $2,500. Therefore Phill is more of a convenience than a cost saving measure. With the CNG cost of $.80 per gallon and an overall cost of $6,000, to buy and install Phill, the fuel will actually cost around $2.80 per gallon when the cost of the purchase & installation is included. Of course you can buy CNG at most public stations for less than this price. However in many areas there are government rebates and tax credits available that can bring the cost down. 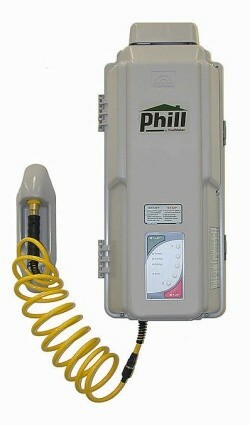 The Phill can be purchased and installed by Mansfield gas equipment systems their office number is 909-466-6920. CNG products produce much less pollution. CNG engines reduce nitrogen and carbon monoxide by 90%. It also produces 20-30% less green house gases than gasoline and diesel. CNG cars have much less wear and tear on the engine and exhaust systems because they are so clean burning. For instance the oil only has to be changed every 12,000 miles instead of 3,000 miles. Nearly 100% of the natural gas is produced in the United States for the United States. There is enough natural gas in current reserves today to completely reduce the amount of imported oil to zero if all the automobiles were converted to natural gas. And at the same time we would be reducing our balance of payments by about a billion dollars a day. We have enough natural gas to convert all of our cars and trucks to natural gas and still have enough natural gas for the next 100 years. However there are many ways to reduce our usage of natural gas today and make it last longer than 100 years. 59% of all natural gas consumed in the United states is for heating. For one the natural gas furnace for homes, which is probably one of the biggest users of natural gas, are mostly in the 70-75% efficient and changing all of these to 95% efficient furnaces would reduce that consumption of a very large amount of natural gas by more than 20%. Learn more about 95% furnace efficiency by contacting a local heating and air conditioning contractor. Also natural gas cars are very similar, and the entire infrastructure to transport and compress the natural gas would be very similar for hydrogen fuel cars. In the past when oil companies talked about that, they talked about using hydrogen gas to fuel cells, however fuel cells are very expensive, about one million dollars per car and hydrogen can be burned in a car just like natural gas can be burned. When you burn hydrogen in the car the only by products that you have are water, which has no green house effect and no pollution effect at all. Hydrogen can be unlimitedly produced by just electrolysis of sea water so as long as the electrolysis is done by photo cells or windmills or nuclear power plants we will have no green house emissions whatsoever and the cars when produced in volume will cost no more to produce than gasoline cars.